Home - Our Business is God’s Business! The BWIN Women of Excellence Awards Ceremony honors the achievements and accomplishments of Women in Business. Recipients are chosen for being women of integrity, faith and action who are committed to serving and impacting their workplaces, their communities and the world. These women inspire, motivate and educate! This year, executives, influential community leaders, business women and entrepreneurs will gather for the BWIN 5th Annual Women of Excellence Awards Ceremony to honor these recipients and learn from their inspiring stories. Women who have overcome seemingly insurmountable challenges and reached out to help others, and women who offer hope through their courage, strength and drive to give back to their communities―these are our role models! 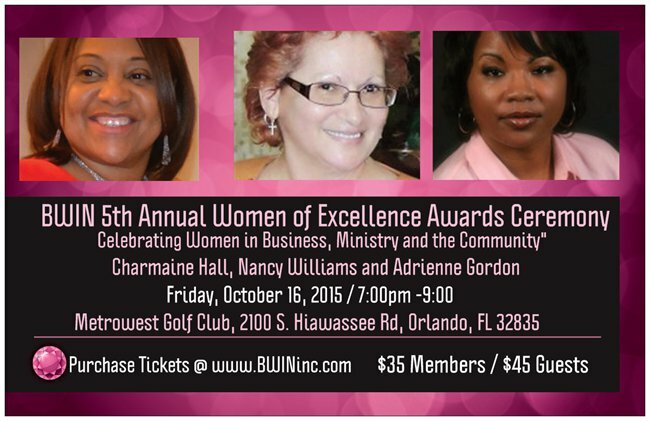 We invite you to join us on Friday, October 16, 2015, at 7:00pm at the beautiful Metrowest Golf Club, 2100 S. Hiawassee Road, Orlando, FL 32835 as we honor and three phenomenal women in front of their friends, family, colleagues and guests. It will be a night to remember!